chinwi wrote: Another 777 almost lost ! A miracle saved them from a mid air collision in a busy route. This time, pilots of Jet Airways B 777 fell asleep and their plunged 5,000 feet from 34,000 to 29,000 without clearance from ATC in a busy air route over Turkey airspace. They say the pilot of the Boeing 777 aircraft was taking 'controlled rest', which means a nap as per rules. The co-pilot, who was supposed to hold fort in the cockpit, claims she was busy on her tablet and did not notice that the aircraft had lost altitude. Other aircraft were flying at the altitude that the aircraft had descended to. The co-pilot awakened the pilot when the Ankara ATC -air traffic controller- asked them to immediately ascend to 32,000ft. The plane was on auto pilot and reason far the sudden descend is not reviled yet. If the plane was on auto pilot mode, descend of plane is very unlikely. How should the co-plot did not notice the lost of altitude. Must be she lost the control of plane because of sudden sleepiness. My wife is flying Malaysian on Friday, do you think I should get a insurance policy ? Really like to read this topic/update for general knowledge. Shall we change the topic with appropriate one like "world flight update" or some thing. The Frenchman, an author and the ex-head of the now-defunct Proteus Airlines, believes the Boeing 777 was downed by US Air Force assets from the British-controlled Indian Ocean island of Diego Garcia. The Malaysia Airlines plane was remotely hijacked by unknown persons before being blasted out of the sky by the American military, fearing a terrorist attack similar to 9/11, according to Mark Dugain. Mr Dugain said he had travelled to the Maldives and spoken to locals who claimed to have seen a "huge plane" flying overhead at low altitude in the direction of Diego Garcia. According to an article penned by Dugan in French weekly magazine Paris Match, one fisherman told him: “I saw a huge plane fly over us at low altitude. In a separate radio interview, Dugain claimed that a British intelligence officer had warned him of the “risks” in investigating MH370’s disappearance, suggesting instead that he “let time do its work”. This year has seen a post-Cold War record number of Russian jets and other Russian military aircraft buzz and even breach NATO airspace in the Baltics as well as off the coastline of North America and even Japan. The Russian jets most often fly without operating transponders — devices installed on all commercial and military airplanes allowing the aircraft to be easily spotted and recognized from the ground. But the lack of a transponder signal was not the only reason the Russian jet went undetected until the last minute — and the same may be true for Flight 370, according to independent investigator and aviation journalist Jeff Wise. Wise notes that the Russian jet last week was flying on a route that took it along a boundary between two Flight Information Regions, or FIRs. A FIR is the territory in which air traffic controllers of one country have jurisdiction, and which controllers in neighboring countries ignore. The Russian jet last week may have been deliberately flying along FIR boundaries to test how effectively it could avoid NATO detection using that method, Wise wrote on his blog. When Malaysia Airlines Flight MH370 shut off all communications on March 8, it was flying in exactly such a boundary area between Malaysia and Thailand, being watched in the sky by no one. Flight MH370 continued to fly along FIR boundaries for much of the remainder of its rogue flight, according to the route that investigators believe the plane took. If indeed the Malaysia Airlines plane was commandeered by high-tech hijackers, it may have been employing the same technique now employed by the Russian jets, and that possibility could provide a clue as to how the plane was stolen. The puzzle I have in going through is how come a large plane with sophisticated equipment be remotely controlled ?, how come the transpondent be switched off? May be some one within on-board could do that? If this a true statement it highly jeopardise the entire aviation security systems and giving ideas to terrorist in embarking on a process to study these things. If that is the case the authority which is in command of aspects in relation to aviation security should re visit their current security procedures in relation to aviation. Also such claims may equally valid forr MH 17 as well if that is correct. This is in contrast to operations still underway in Indian Ocean off western Australia spending huge sum of money in finding a clue of missing air craft. These electronic “handshakes” or “pings” contained no actual information, but by analyzing the delay between the transmission and reception of the signal— called the burst timing offset, or BTO—Inmarsat could tell how far the plane had been from the satellite and thereby plot an arc along which the plane must have been at the moment of the final ping. On March 24, the Malaysian prime minister, Najib Razak, announced that a new kind of mathematical analysis proved that the plane had in fact gone south. This new math involved another aspect of the handshakes called the burst frequency offset, or BFO, a measure of changes in the signal’s wavelength, which is partly determined by the relative motion of the airplane and the satellite. That the whole southern arc lay over the Indian Ocean meant that all the passengers and crew would certainly be dead by now. This was the first time in history that the families of missing passengers had been asked to accept that their loved ones were dead because a secret math equation said so. To fit both the BTO and BFO data well, the plane would need to have flown slowly, likely in a curving path. But the more plausible autopilot settings and known performance constraints would have kept the plane flying faster and more nearly straight south. I began to suspect that the problem was with the BFO numbers—that they hadn’t been generated in the way we believed.14 If that were the case, perhaps the flight had gone north after all. For a long time, I resisted even considering the possibility that someone might have tampered with the data. That would require an almost inconceivably sophisticated hijack operation, one so complicated and technically demanding that it would almost certainly need state-level backing. And yet, once I started looking for evidence, I found it. One of the commenters on my blog had learned that the compartment on 777s called the electronics-and-equipment bay, or E/E bay, can be accessed via a hatch in the front of the first-class cabin.15 If perpetrators got in there, a long shot, they would have access to equipment that could be used to change the BFO value of its satellite transmissions. I realized that I already had a clue that hijackers had been in the E/E bay. Remember the satcom system disconnected and then rebooted three minutes after the plane left military radar behind. They turned on the satcom in order to provide a false trail of bread crumbs leading away from the plane’s true route. Once I threw out the troublesome BFO data, all the inexplicable coincidences and mismatched data went away. The answer became wonderfully simple. The plane must have gone north. There aren’t a lot of places to land a plane as big as the 777, but, as luck would have it, I found one: a place just past the last handshake ring called Baikonur Cosmodrome. To the best of my knowledge, this airstrip is the only one in the world built specifically for self-landing airplanes. The complex has been slowly crumbling for decades, with satellite images taken years apart showing little change, until, in October, 2013, a disused six-story building began to be dismantled. Yet why, after decades, did the Russians suddenly need to clear this one lonely spot, in the heart of a frigid winter, finishing just before MH370 disappeared? චූටිපුතාට විතරයි ද මතක් උනේ ? New theory Captain flew over home town to get a last look ! MH370's captain, Zaharie Ahmad Shah, who comes from Penang, performed a U-turn after turning off the flight's transponder to have a last emotional look at Penang. After flying along the border between Malaysia and Thailand, the aircraft reached Penang and made three turns in quick succession. Captain Simon Hardy, a senior Boeing 777 captain with a major commercial airline, spent six months analysing Inmarsat's satellite communication "handshake" arcs and using mathematical "reverse engineering" to arrive at his conclusion. "It took me months to work out what this was," Hardy tells The Sunday Times. "The clue was Ayers Rock [in Australia]. I have done the same manoeuvre there, to look down and get a great view. Somebody was taking a last emotional look at Penang." He believes the "fly-past" holds the key to the perpetrator, suggesting that Shah did a "nice long turn and looked down on Penang". He believes that the missing Malaysia Airlines plane was intentionally landed on the water and sank intact about 100 nautical miles away from where ATSB is currently conducting its search, and outside the core target area being trawled. KUALA LUMPUR, Malaysia (AP) — The first comprehensive report into the disappearance of Malaysia Airlines Flight 370 revealed Sunday that the battery of the locator beacon for the plane's data recorder had expired more than a year before the jet vanished on March 8, 2014. Paul Kennedy stared at his sonar on March 7 in disbelief: He saw what looked like a debris field on the floor of the Indian Ocean. It’s Flight 370, he thought -- the Malaysia Airlines plane that had vanished 364 days earlier. A camera was raced down to confirm that the aircraft’s wreckage had been found. Satellite Internet on the search vessels was cut off to prevent the news from leaking. The cameras brought back the truth: No wreckage, just volcanic boulders and starfish crawling over a silty sea floor. At Fugro’s operations center, surrounded by mallee-tree scrub in the northern suburbs of Perth, Australia, analysts who’ve been clicking through orange-and-yellow sonar images in search of the plane since last October aren’t deterred. While investigators try to understand why a Germanwings pilot deliberately crashed his flight on March 24, the current search for Malaysian Airline System Bhd.’s Flight 370 is winding down with no answers about the fate of the 239 people on board. Australia’s A$39 million ($30 million) contract with Fugro runs through August 2016, but Australia, Malaysia and China haven’t agreed on funding for any further searching after May. Government ministers are slated to meet to discuss the issue later this month, a spokesman for Australian Deputy Prime Minister Warren Truss said by e-mail. More than 60 percent of the main search zone has been scanned without finding any sign of the Boeing Co. 777-200. The rest of the zone should be analyzed more quickly, Duffield said, allowing searchers to finish the task before the end of May, when the seas become too rough to navigate. Fugro, which mostly surveys the seabed for oil and gas and telecommunications-cable companies, has nearly 200 people dedicated to the search, including two 30-person crews on each of its three search vessels. Fewer than 20 people sit at desks here in Perth, carrying out more detailed analysis of the roughly 10 objects a week deemed worthy of further study. Hopes still run high among members of the team. Duffield, who expects that the search will indeed continue beyond the current stage, is already fitting out his ships to handle winter weather further to the north, where seas are calmer. The main question at this stage is whether Flight 370 glided for longer than expected after it ran out of fuel, or plunged into the sea further north than assumed, Martin Dolan, chief commissioner of the Australian Transport Safety Bureau, said in a March 27 interview. It’s “possible but highly unlikely” that one of the pilots was flying the plane to the end, said Dolan, the main government official responsible for the hunt. If the plane isn’t found by late May and funds permit further investigation, “we would move further north, but we’d also have to contemplate whether we would go wider” from the place where fuel ran out, Dolan said. For the moment, Duffield is focused on filling in gaps that amount to four or five percent of the 36,000 square kilometers scanned so far. Eyeballing the images is still the most reliable way of spotting debris, said Magnus Windle, the team’s lead geophysicist. Nice simulations but hard to buy the theory. So this is what Maths professors do when they get bored! If he'd stepped out of his classroom and sat by the pool for a while he'd have realised how hard it is for a conscious human being to make a perfect vertical entry into a calm swimming pool. What are the chances of a fully loaded aircraft doing this successfully in a rough ocean in the middle of the night? The Actual World is far different from mathematical simulations. The Triple Seven engine is around 13 feet in diameter and have lots of Honeycomb material and they are easily floatable. And there were two monstrous engines fitted on that aircraft and it was a long haul flight with lots of Jet A1 fuel too. Imagine the force of the impact when an aircraft either climbing or descending around 180 Kms and hitting a big bird weight just over 15 kilos. 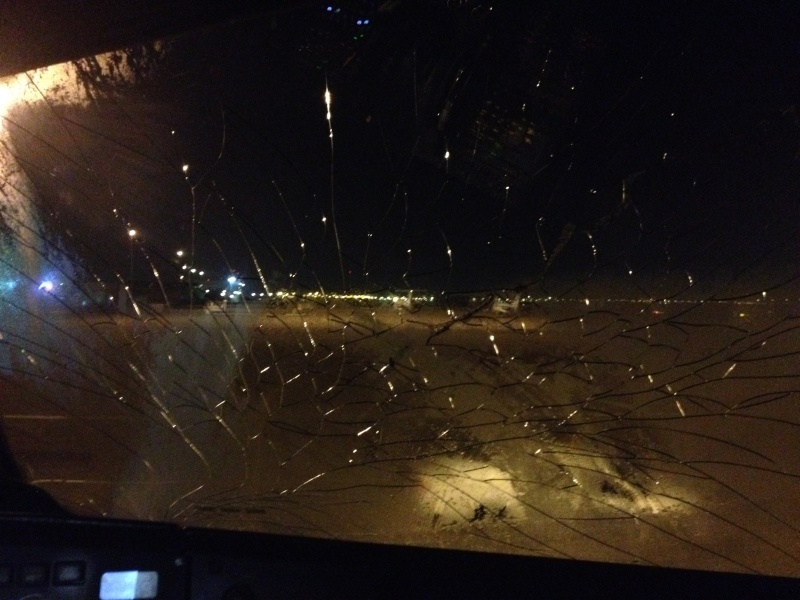 The windshield would crack instantly; even the aircraft is still flyable. Now imagine something weighing more than 300,000 kilos hitting the surface of the water at the speed of sound, what would be the impact. This happened on one of the Sri Lankan A320 hitting a bird while descending in to land at Muscat International Airport a few months ago. No mystery for me. The Air craft is crashed. USA saving a company. Mistery help them to hide the fault of the air craft. sapumal wrote: No mystery for me. The Air craft is crashed. USA saving a company. Mistery help them to hide the fault of the air craft. Actually what happened? Still technology is not developed to find out plane?? or what else? If the Transponders are switched off (or gone off), the aircraft will not be able to identify easily but it will not totally disappear from the Radar screen. The moving blip will be visible (on both civilian as well as military) Radar screens. Let alone the civilian Radars, who were watching the screens from military side with an unidentified blip on their screen and why alerts never went up. Malaysia is considered too westernised and that may have been a reason for the misfortune of MH 370. Anyway, how people think cannot be predicted! So be on the watch out PUTHA. Your best friend might do you in with no rime or reason!